November 14th, 2017 by Sherman Oaks Dental | Comments Off on Secret Health Food: Pumpkin! We don’t know about you, but, for us, one of our favorite parts of the year is here. The holiday season from November to the New Year is full of festivities and fun. There is also no shortage of food to be found during this time of year. Because there is so much food to go around, especially during Thanksgiving, it is important to think about ways to make good choices that will have positive impacts on your dental and overall health. One of the main ingredients used during Thanksgiving and autumn is pumpkin. Who doesn’t love a pumpkin pie or a warm loaf of pumpkin bread? Regardless of what your favorite pumpkin treat is, there is a lot of the ingredient to go around this time of the year. Did you also know that pumpkin is good for your health in many ways? At Sherman Oaks Dental, we love to educate our patients on foods that are good for your oral hygiene. We want to help our patients make good choices related to their dental health. It’s great to know that pumpkin is a great health good that is also good for teeth. This is because pumpkin is nutrient-dense. Pumpkin has many vitamins and minerals that are great for you. This ingredient is also low in calories. 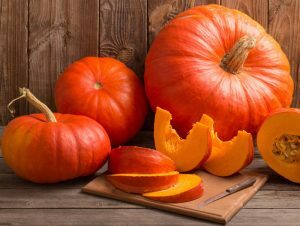 What are the specific ways pumpkin is good for your health? The USDA National Nutrient Database has found that 1/2 cup of cooked pumpkin has many health benefits. It only has 40 calories and has 1.8g of protein. Also, 1/2 cup of cooked pumpkin has 3g of fiber. Looking further at the vitamins and minerals in a cup of cooked pumpkin, they found that 100% of the daily intake for Vitamin A can be found in this food. Also, pumpkin contains potassium, manganese, copper, and calcium. How is pumpkin good for your teeth? Being full of calcium, pumpkin can help with healthy bones and teeth. Beyond this, pumpkin is full of magnesium which is really good for healthy tooth enamel. Magnesium works like calcium and helps grow enamel that resists tooth decay. Of course, pumpkin spices and flavors do not give health benefits. So, sadly, that pumpkin spice latte isn’t going to do much for you health wise. As always, if you have a question for us or would like to schedule an appointment, contact us today! Our Naperville family dentistry is taking new patients!